Will Social Media Bring Us Together or Tear Us Apart? The rise of the Internet and Social Media have greatly impacted us as a society; for the better and for the worst. The aspects of Social Media and the Internet that may tear us apart as a society include the fact that we have less face-to-face interactions in our every day lives. Society has turned to different new technologies as a huge medium of communication including cell phones, texting, emailing, etc. The newspaper industry has greatly suffered at the hands of the Internet and classifieds sites such as Craigslist. Print newspaper subscriptions and print advertisements have always been the main source of revenue for newspaper companies. Now that many articles are posted online, many people are unsubscribing from print newspapers. According to this New York Times blog article, the New York Times Company saw it’s stock decline by 54% from 2004 to 2008 as people began to read more news articles online and the company began to struggle. As the Internet gains popularity, the newspaper industry may continue to deteriorate. Social Media sites such as Facebook and Twitter have led way to a new “Internet society” in which people often bully others while hiding behind their computer screen. 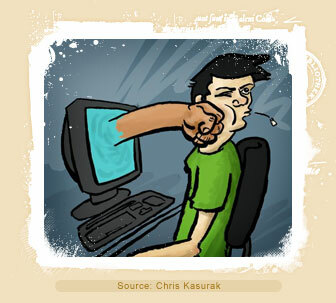 Cyberbullying has emerged as a huge problem in society because of these Social Media sites. The Simon Wiesenthal Center reports that online terror and hate on Social Media websites is on the rise with a 30% increase from last year. Social Media encourages hate and bullying. In the scheme of things, the negative impacts that the Internet and Social Media have had on our society do not outweigh the positives. The Internet is very useful; children learn from online games and interactive homework assignments, people are kept up to date with breaking news on sites such as Google News, investors can keep track of stocks, etc. Although the Internet has hurt the newspaper industry, we see these companies conforming to the new “Internet society” and its demands. According The Guardian, since the New York Times paywall was activated in March, it was announced that it more than doubled the number of paid subscribers to 250,000. Overall, the paper has more than 1 million digital subscribers. It is projected that the paywall will be an overall success, and allow Newspaper companies to become more competitive in the journalism industry. It is obvious that there are many positive and negative aspects of the Internet and Social Media. As a society, we have evolved and continue to evolve as the Internet becomes a more important aspect of society. All in all, I believe that the Internet and Social Media have contributed to our society as a whole, and will continue to bring us together in the future. According to the Cyberbullying Research Center, about half of young people in the United States have experienced some form of cyber bulling; 10-20 percent of those people experience it regularly. Cyber bullying is defined as when a child or teen is threatened, teased embarrassed or harassed by another person using the Internet or another form of technology. Some other frightening statistics show that cyber bullying is on the rise and becoming an increasing problem in today’s society due to the fact that so many teens use social networks to communicate; over 80 percent of teens use a cell phone regularly. In addition to social media, cell phones are a very common medium for cyber bullying. Cyber bullying victims are more likely than non-victims to have a low self esteem and consider suicide. Most recently, in October 2011 Amber Cole, a 14-year old girl from Baltimore, MD, was filmed (without her consent) performing sexual acts with her ex-boyfriend. The video was then spread around social media sites and she became a worldwide target for cyber bullies. #AmberCole became a trending topic immediately following the release of the graphic video and she has been a target for Twitter-bullies ever since. She said that the release of this tape has ruined her life and her reputation. As seen in this New York Times blog, the Pew Research Center released a survey which shows that 88 percent of the teens surveyed said they witnessed “people being mean or cruel” on social networking sites such as Twitter and Facebook. Another shocking fact is that one in five admitted to joining in on the cruelty. If one in five of those surveyed admitted to being cruel, how many of these teens actually participate in the cruelty but do not admit to it? In recent years there has been an increasing number of cyber bullying cases that have ended in suicide. According to this article from the South Carolina State University, Alexis Pilkington, 17, committed suicide in March 2010 in New York because of a number of cyber bullying attacks that she received from social media websites, especially FormSpringMe. On October 7,2003, Ryan Halligan, 13, hung himself because of harassment he received at the hands of his peers. They spread untrue gossip, told him to kill himself and drew him into an online conversation that was later copied and pasted and spread to his entire school. It is no secret that the problem of cyber bullying is on the rise and that many teenage lives are at risk due to this epidemic. What are adults doing to stop cyber bullying? According to the Cyberbulling Research Center, by September 2001 46 U.S states had some kind of law against cyber bullying. The Anti-cyber bullying law in South Carolina includes all means of electronic communication—the Internet, mobile phones, cameras, etc. Although many states have these laws, they include major flaws. Generally speaking, most of the laws allow law enforcement to act upon cyber bullying only if they occur within an educational setting. This is obviously a problem because many teens use their own computers at home, which means that they are able to cyber bully without consequences if their parents are not aware of their Internet activity. This means that until these laws are amended to be more strict, parents should limit and monitor their children’s time on the Internet and cell phones, and listen to cries for help from their children that may be affected by online bullying.